WR Dawson Electricians TV and Satellite specialises in home cinema installations. Paul McCaffrey, Assistant Manager at Superfi in Lincoln. Wayne Dawson, WR Dawson Electrician TV and Satellite. 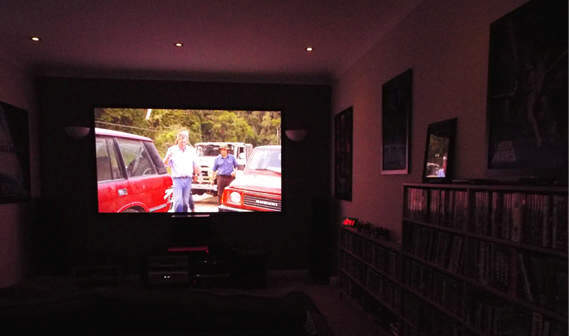 Challenge: Wayne Dawson, a Custom Installer from Lincolnshire, wanted to upgrade his own dedicated home cinema room with a new projector. It needed to have excellent image quality and brilliant colours but would not break the bank. Solution: After seeing a demo from Lincoln-based home cinema specialists, Superfi, Wayne opted for and installed the Optoma HD91. 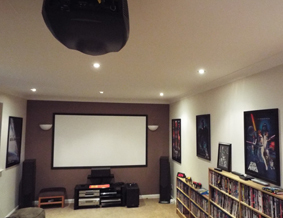 Wayne Dawson, a Custom Installer from Lincolnshire, is usually busy installing home cinema systems for his customers, but wanted to upgrade his own dedicated home cinema room. Wayne’s existing Infocus home cinema projector was five years old. He wanted a new projector that has excellent image quality with brilliant colours but would not break the bank. 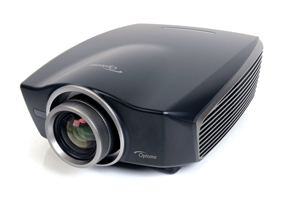 Lincoln-based home cinema specialists, Superfi, did a demonstration of the Optoma HD91. This full HD 3D 1080p projector harnesses the latest LED technology. It features DLP® technology from Texas instruments which uses millions of tiny mirrors to maximise the available light output and high contrast while completely eliminating crosstalk. It uses frame-interpolation processing, PureMotion4™, which gives advanced motion control processing. This eliminates motion blurring and image judder, even in high-speed action sequences and 3D modes. Its PureColour™ provides balanced colours for vibrant, vivid and natural images. This works in conjunction with an independent Colour Management System giving precise control of the colour reproduction. Deep Colour makes it possible for the HD91 to reproduce billions of colours ensuring smooth tonal transitions and subtle graduations between hues. Dynamic Black™ uses ultra-fast LED switching times to dynamically adjust brightness frame-by-frame to produce deeper blacks for exceptional shadow detail in dark scenes, whilst displaying crisp and clear bright scenes. Wayne installed the HD91 in May 2014. He was able to use his existing universal bracket to swap projectors. He connected his Playstation to feed directly into the projector via a second HDMI cable, which he uses predominantly for 3D films, Internet and as a catch-up player. He linked the 7.2 surround sound through a Sony Amp. The system connects his Sky HD player and Blu ray and HD DVD players. As well as image quality, a determining factor for Wayne’s choice was the long lamp life inherent with LED projectors. LED technology offers consistent brightness and colour performance. This means the HD91 will maintain its out-of-the-box image quality without the need for expensive lamp changes or re-calibration throughout its lifetime. LEDs produce less heat and need less cooling, which saves energy and makes the projector quiet. This also enables the projector to be installed closer to walls, ceilings or within cabinets. The lens shift and wide zoom range make the HD91 flexible to install and the projector’s light weight (7kg) and compact size simplifies installation further. 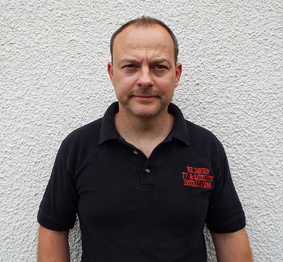 Wayne established his company, WR Dawson Electrician TV and Satellite, two decades ago but has specialised in home cinema installation for the last 5-6 years. He said: “Not everybody can afford an all-singing all-dancing home cinema system but there are some areas where costs can be saved. For example, my screen is actually the wall. I researched paint that would not reflect and Dulux’s flat matt white emulsion is ideal. I finished this off with a black architrade to frame the viewing area. It is picture perfect! “However, you can make the room as cheap as you want, but you still need quality equipment to project the image. The HD91 produces an amazing picture at an affordable price. Visitors to Wayne’s local pub, the Barge and Bottle, now enjoy the football on his old projector – so everyone is a winner! Paul McCaffrey, Assistant Manager at Superfi in Lincoln, said: “The HD91, in my opinion, is the best home cinema projector I've ever seen and a game changer in the world of home projection. Optoma HD91, Sony Playstation, 7.2 surround sound, Sony Amp, Sky HD player, Panasonic Blu-ray player, Toshiba HD DVD player and Matching Mission Speakers.